What started out as a calm day for the second anniversary of Michael Brown’s death, quickly changed Tuesday evening during a protest in Ferguson when gunshots were fired. About 75 protesters were lined up along Florissant Avenue when a car came speeding by and hit one of the protesters. Some witnesses tried to block the car from fleeing the scene. 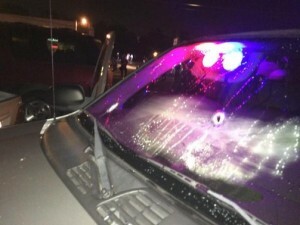 The vehicle backed up and sped off, causing several to pull out guns and start firing at the vehicle. The man injured by the car was taken to the hospital in a private vehicle. His condition is unknown. No other injuries were reported. The demonstration was a reminder to the community about a life lost two years ago when then-Ferguson police officer Darren Wilson shot and killed 18-year-old Michael Brown, Jr. The killing spurred national attention over race and policing, as well as weeks of demonstrations and violence in Ferguson.